"From great sounding rooms to hiring gigging equipment, we pride ourselves on doing all we can for our customers." Based in Norwich Norfolk, we offer six top quality rehearsal rooms. The rehearsal rooms are all designed for clarity of sound by the acoustic specialists from 'Studio Wizard' & soundproofed by their professional engineers. Earth Studios has been running as a rehearsal studio since 2003. Run by John Fisher (PUT DOWN THAT COFFEE!) and a small dedicated team of people, who have technical knowledge in various areas, allowing a broad spectrum of help & advice to bands & musical artists. We also offer on site help and advice, important accessories to hire or buy, plus relaxing rest area to have a break for refreshments or inspiration, the chance to chat with other bands & musicians using our facilities. New! 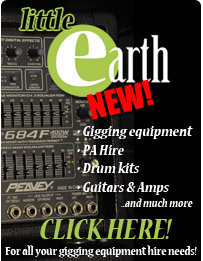 Little Earth - PA systems, equipment hire & accessory shop. We have a selection of PA systems including amps, speakers, cables, microphones and stands which can be hired for gigs and events. Also gigging equipment: guitars, guitar amps and drum kits to hire. Plus onsite accessory shop. A place for musicians... run by musicians. Little Earth has a small accessories shop within the studio in case musicians need strings, plectrums, drumsticks, batteries etc whilst in the middle of rehearsals.